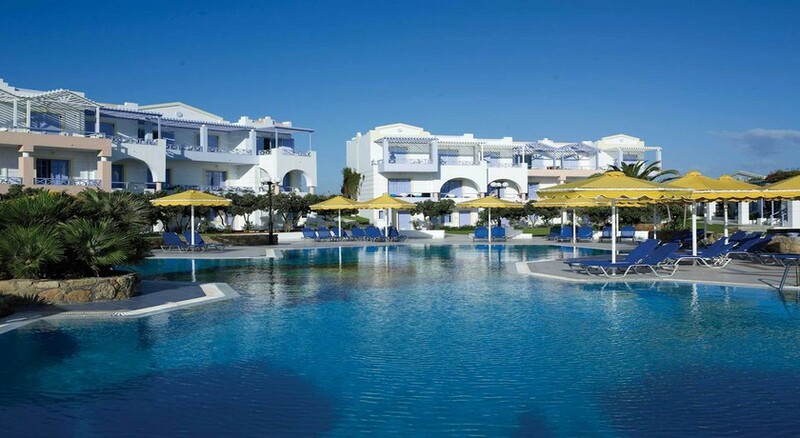 Serita Beach Hotel is an all-inclusive beachfront property in Crete. The hotel is an ideal destination for families, groups, couples or individuals to spend a relaxing holiday by the Aegean Sea yet stay close to all happening places of the Island. 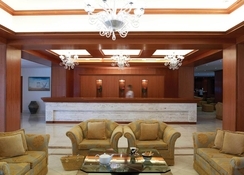 The hotel is located about 22 km away from Heraklion airport. The hotel owns a private beach which is about 150 metres from the main building. The nearest town is Hersonissos about 5 km away with countless shopping centres where you will find jewellery, furs, clothes and other gift items in abundance. Hersonissos offers a lot of other exciting sights such as Aquaworld Aquarium & Reptile Rescue Centre (4 km), Lychnostatis Museum (6 km), etc. Heraklion (25 km) is another nearby city where you will find numerous shops and other places of interest including museums, waterpark, stable for horseback riding and nightclubs. For some beautiful beaches and breathtaking views, head up to Agios Nikolaos (57 km). 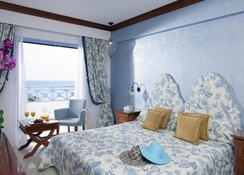 The 276 rooms are categorized into standard, family, bungalow and family bungalow. All guestrooms are decorated with comfortable furnishings, luxurious decor and modern conveniences. Amenities such as double or twin beds, air conditioning, telephone, television, minibar, paid in-room safe box, etc. with an en suite fitted with bath tub, hair dryer, etc. 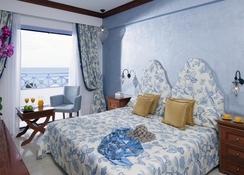 Standard rooms can accommodate up to four guests at max. Family rooms can also accommodate four guests in two separate bedrooms. Bungalows and family bungalows can also accommodate four guests. All guestrooms have marbled or tiled floor with wooden furniture and balcony or terrace furnished with comfortable chairs to enjoy an evening drink or a morning coffee. The main restaurant serves buffet breakfast, lunch and dinner. The cuisine varies from local to international, with an assortment of food along with delicious desserts. The food is accompanied by a variety of beverages such as local alcoholic beverages and cocktails, fresh juices, coffee and tea. The Tavern is an a la carte restaurants and snack bar, and serves fire oven pizza, etc. In addition, there are two bars that serve beverages, poolside and lobby. Alternatively, you can find loads of restaurants and bars in the vicinity. 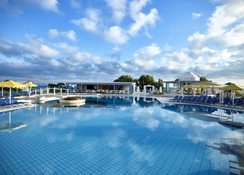 There are two outdoor swimming pools one with water slides lined with sun beds and parasols. The resort features various activities for children including paddle pool, playground, mini club, games corner, animation program and disco throughout the week, etc. Sports facilities on site include two floodlit tennis courts with lessons and rental equipment, table tennis, water polo, beach volleyball, etc. while the private beach offers pedal boats, canoeing, wind surfing, etc. The lobby bar has a small stage where the animation team organises live dance and music shows for adult guests. Guests can also enjoy the folklore or barbeque nights organized often by the hotel animation team. We had a very pleasant stay at this hote. There were lot of choice of food and restaurants. Maria the manager was very nice person and made us very comfortable.